Seal Tech advises homebuilders and contractors that no additional interior or exterior air infiltration protection, beyond building wrap, is necessary when applying the Seal Tech Insulation System which incorporates Spray Foam. Because of Spray Foam’s low permeance, Seal Tech can prohibit infiltration by moisture-laden air. Air movement is the primary mechanism for moisture transfer accounting for about 98% of all vapor movement in insulated cavities. The Seal Tech Insulation System completely fills any shaped cavity and adheres to all materials providing a vapor seal unrivaled by any other insulation product. We have been taught that the vapor barrier, (using traditional insulation products), should be installed facing the warm side of the home. In areas of extreme heat/cold, such as the Midwest, the warm side of the home changes with the seasons. It is on the inside during the winter months and on the outside during the summer months. This has lead many experts to weigh the benefits/drawbacks of using vapor barriers in these climates. Spray Foam eliminates this controversy by providing a vapor barrier which protects all year long regardless which side is the warm side of the home. Research in Canada supports the position that vapor retarders can do more harm than good. While they may work well in cold Canadian winters, they can cause serious problems in humid periods during the summer. The Canadian research states that designers often ignore the role air conditioning plays in this problem. 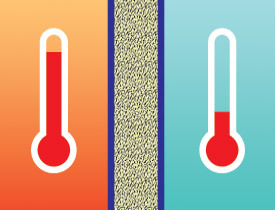 When air conditioning is running on a hot humid day, the temperature of the poly vapor retarder on the inside of the wall reaches the dew point. Moisture driven into the wall condenses on the back of the poly material. The Canadian research says that a designer should rely on the painted surface of the drywall as an effective vapor retarder. Even ordinary latex paints perform adequately for stopping moisture. However, the bulk of the moisture that moves into an enclosed cavity is transported by air. Seal Tech prevents this part of moisture movement by professionally installing Spray Foam in these enclosed cavities. As well as simplifying the construction process for the builder, Spray Foam insulation eliminates the major causes of building envelope problems, air-borne moisture movement and entrapment. Heating and cooling costs are typically reduced by 30 to 50%.